Train harder, perform better and recover faster! SKINS A400 Compression Half Tights help support your quads and hamstrings. 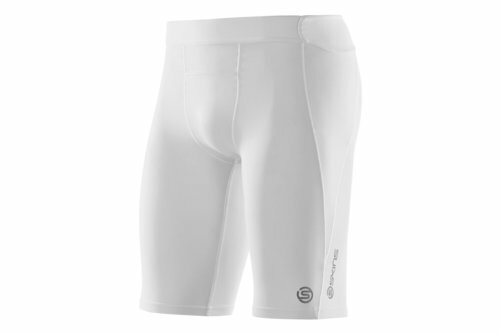 Softly constructed from five different technical fabrics for optimal dynamic compression of your powerhouse leg muscles, controlled pressure is also applied to the ITB and TFL muscle groups which are at more risk of injury when running. With enhanced performance and less risk of injury, you can tackle any action with confidence and in great comfort. It's all very well having the features but if the comfort lets you down then you just won't wear the kit. That's why SKINS have incorporated A-Seams for maximum durability but without the annoying chafing so you are left to focus on your performance in supreme comfort. ADAPTIVE Technology even keeps you warm when it's cold and cool when it's hot so you are always at a comfortable temperature during any activity. SKINS really know how to look after their athletes and so subtle yet welcome details include a wider waistband and shaped crotch for added comfort as well as a small pouch inside the back of the waist for essentials. Sporting a plain white look to the half tights, a golden pattern and SKINS detailing add a classy touch befitting of this high performance wear. To give yourself the edge, check out our SKINS collection for the complete training kit.